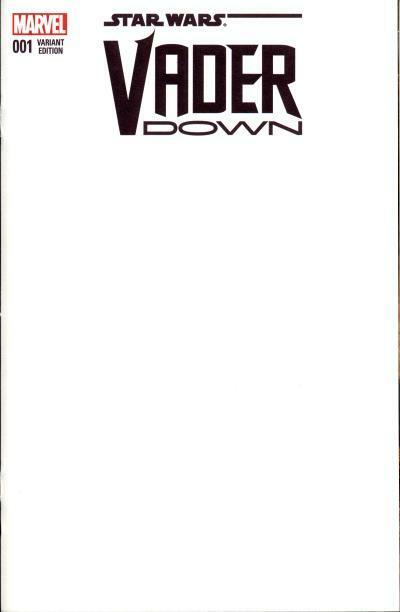 In February 1994 Image Comics imprint Wildstorm published Gen 13 #1 with 13 variant covers which was a large number of variants for a comic book at the time. 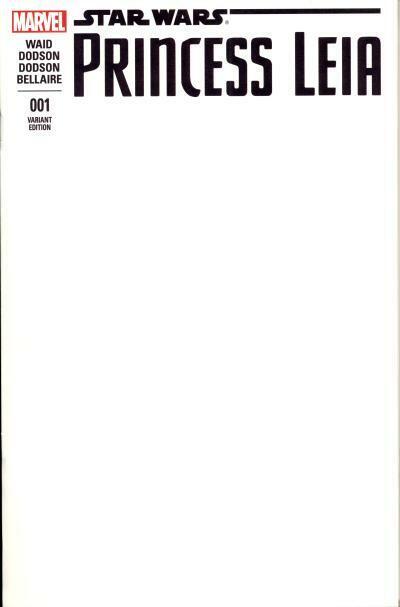 One of the variant cover gimmicks used for Gen 13 #1 would go on to become a staple of modern comics, and that was the blank cover. The Gen 13 #1 blank cover was dubbed the "do it yourself cover" and was meant for the comic reader to draw their own picture. 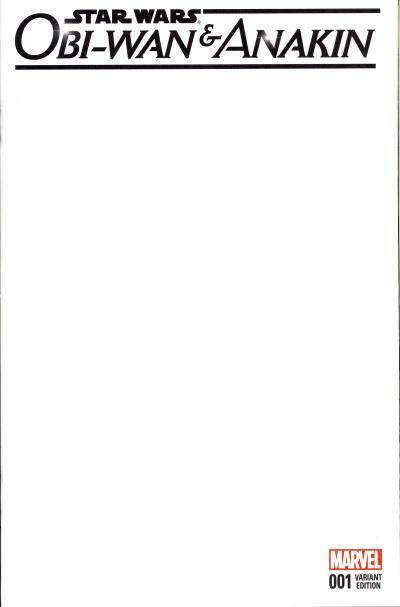 Today's blank covers are aimed at readers wishing to get a unique, one of a kind drawing by their favorite artists. 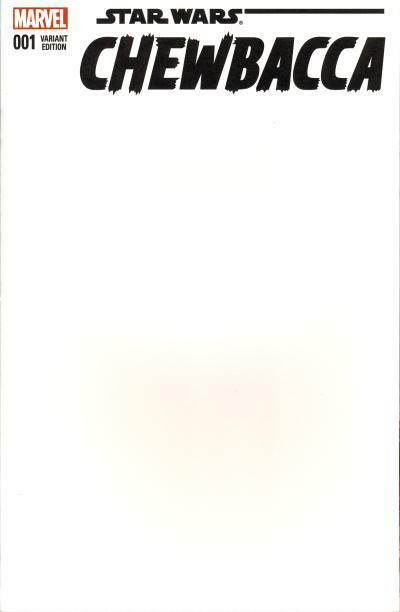 Blank covers are an inexpensive way for a comic publisher to sell more comics. 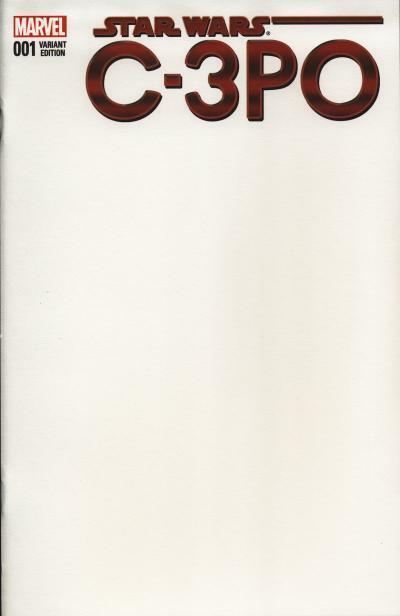 Most are just the standard issue, including the standard cover, wrapped by a blank cover with the publisher brand and title of the comic. 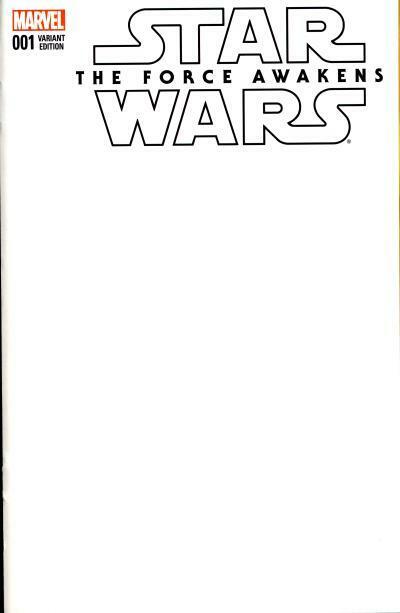 In the case of the Marvel Star Wars titles, the thicker paper stock used is suitable for an artist to sketch on. 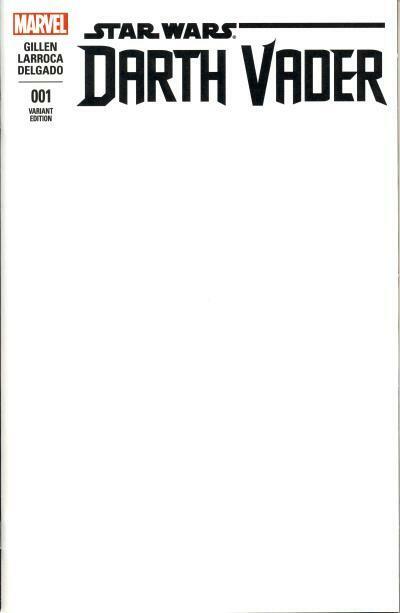 To date, every non-reprint Marvel title has a first issue variant that is a blank cover. It is hard to believe today, but for a fan in March 1978, there was not a lot of Star Wars merchandise available to purchase. Much of the original items were paper-based because they were quicker to get to production. Ephemeral products include the original Star Wars novel published in late 1976 and a few series of Star Wars trading cards from Topps in 1977. Kenner also produced some puzzles and a board game, and a lucky fan would have received a Star Wars Early Bird Certificate Package for Christmas 1977 which was redeemable for four Star Wars action figures which were not available yet. 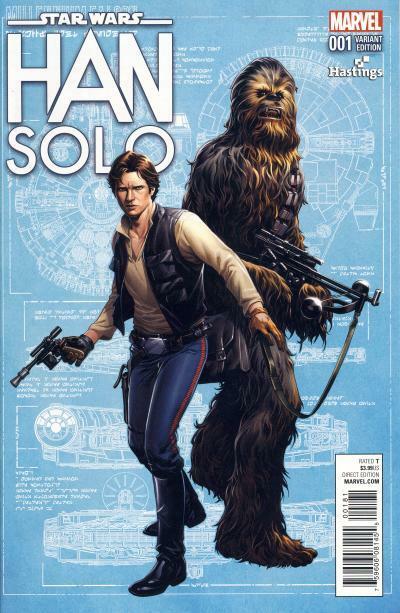 The penultimate chapter in Marvel's first post-movie story starring Han Solo and Chewbacca, Star Wars #9, was on the newsstand as well as Pizzazz #6 with another chapter in The Keeper's World comic strip starring Luke Skywalker and Princess Leia. 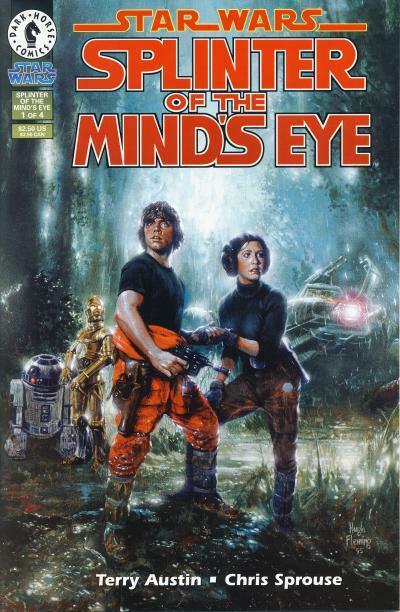 It is in this environment of scant products that the first original Star Wars novel was released, Splinter of the Mind's Eye. For a fan in early 1978 eager for more Star Wars ... well anything, it is hard to imagine that Splinter of the Mind's Eye was not a welcome treat. The novel, written by Alan Dean Foster, contains a story where Luke Skywalker, Princess Leia, C-3PO, and R2-D2 crash on the planet Mimban, an inhospitable swamp world. There, they run afoul of the Imperial presence, befriend two alien Yuzzem and the Force sensitive female Halla, and encounter the mysterious Coway in the caverns beneath the surface. In the end, they confront Darth Vader at the Temple of Pomojema in search of the Kaiburr crystal which strengthens a Force user's abilities. 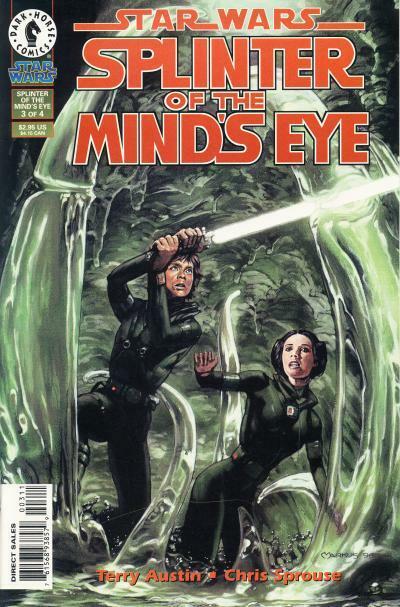 Dark Horse, eager for more content for their burgeoning Star Wars comic line, published a 4-issue adaptation of Splinter of the Mind's Eye in 1995/1996. One of the benefits of running this blog is from time to time, I will get messages from other Star Wars comic fans. I have to apologize to one person, Carsten Olsen, who sent me a link to his blog site back in February. Being the Facebook illiterate that I am, I just noticed his Facebook request today, five months later. I have had a chance to read the link he sent De danske Star Wars tegneserier which translates to The Danish Star Wars comics and it has a lot of information as well as pictures. But don't stop at just that one posting, as his entire blog site is dedicated to Star Wars comics. Visit his site at Star Wars tegneserier. I want to thank Carsten for sending the link. Semic Press began publishing Star Wars for Swedish readers with translations of the Marvel Star Wars series in six Stjärnornas Krig albums or trade paperbacks from 1977 to 1983 followed by ten issues of a comic also titled Stjärnornas Krig from 1983 to 1985. 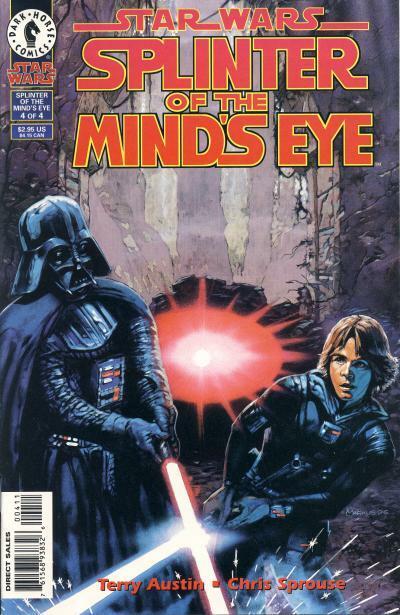 Starting in 1985 Star Wars was combined with another Lucasfilm property, Indiana Jones, in a comic titled Månadens Äventyr or This Month's Adventure. 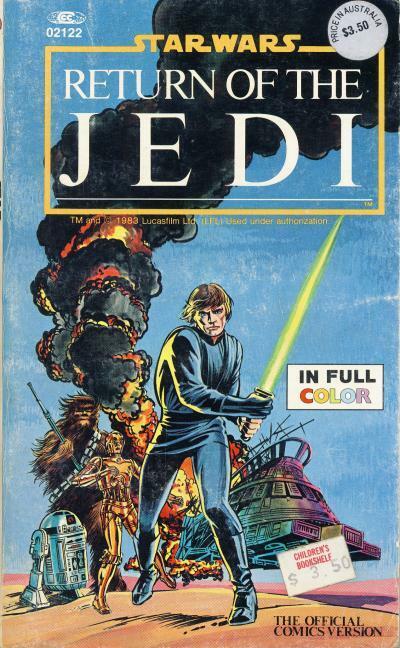 For the seven issues published in 1985, Star Wars would alternate with Indiana Jones every other issue. Each issue contains the equivalent of two U.S. comics. 1986 was more of the same with Star Wars and Indiana Jones alternating issues, but by year's end, Star Wars had taken over the title and throughout 1987 Star Wars was in every issue. The title continued past the last issue, #12 1986, but it took a different direction and published DC heroes stories for Swedish readers. It is interesting to point out that in Sweden series restart numbering from one every year, so issues are identified by combination of the number and year. The final issue of Stjärnornas Krig #3 1985 contains Star Wars #73 and 74. The first Star Wars issue of Månadens Äventyr, #2 1985, continues where Stjärnornas Krig left off and contains Star Wars #75 and 76. 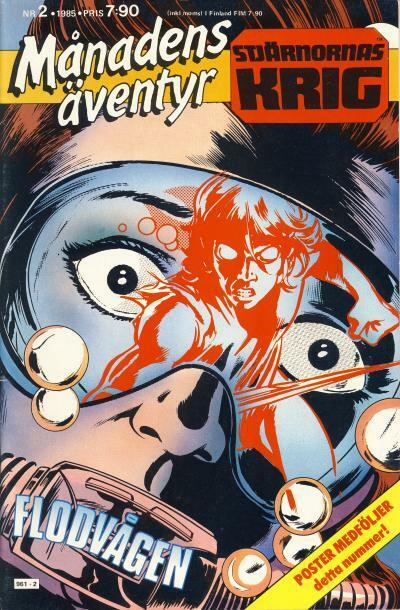 The art used on the Månadens Äventyr covers is the same art used on the U.S. series with the exception of one issue. The cover art for Swedish Månadens Äventyr #2 is from Star Wars #75. The cover also has a blurb that reads Poster medföljer detta nummer! or Poster included with this issue! The poster is attached to the centerfold. 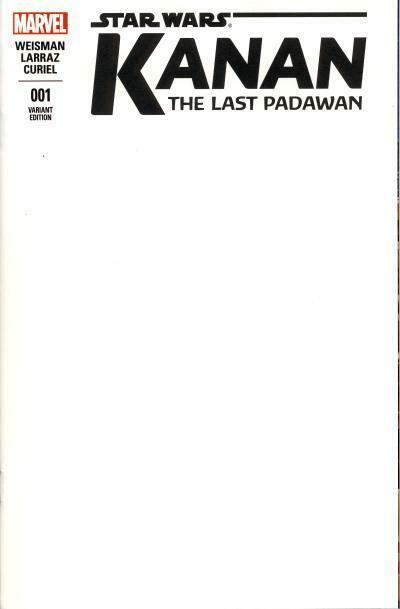 This black and white digest-sized comic is from Indonesia. It has original Star Wars cover art and story. 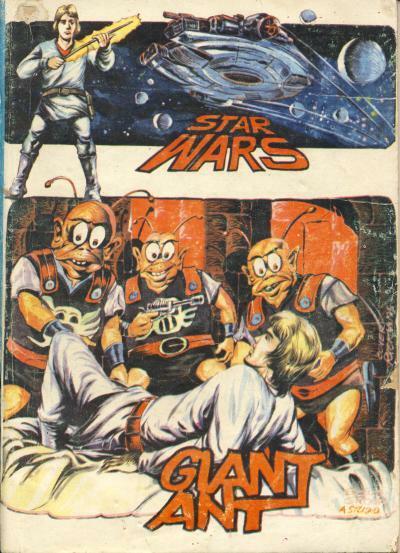 The story is titled Giant Ant and contains one of the more bizarre Indonesian covers. In the header, Luke Skywalker looks like his is about to grab his lightsaber and lose some fingers while the Millennium Falcon soars through a planet filled background. The main art shows 3 ant-like humanoids looming over Luke. From the looks of the interior, the story is as equally strange. To celebrate the 20th anniversary of Star Wars, the Star Wars movies were updated and re-released to theaters as the Star Wars Trilogy Special Edition. Star Wars: A New Hope Special Edition was released in January 1997. Changes to the movie included Greedo shooting first at Han Solo in the Mos Eisley cantina and the addition of a digital Jabba the Hutt's confronting Han Solo in the hangar bay. Dark Horse took the opportunity to publish a Star Wars: A New Hope Special Edition 4-part mini-series with all new art as well as the inclusion of these alterations. Simultaneously with the release of the first issue of the mini-series, Dark Horse released a trade paperback version. Act III Theaters was a movie chain that existed from 1986 through 1998 and operated in the Pacific Northwest and Texas. Dark Horse published 10,000 copies of the trade paperback with an exclusive cover for Act III Theatres to give away to patrons. 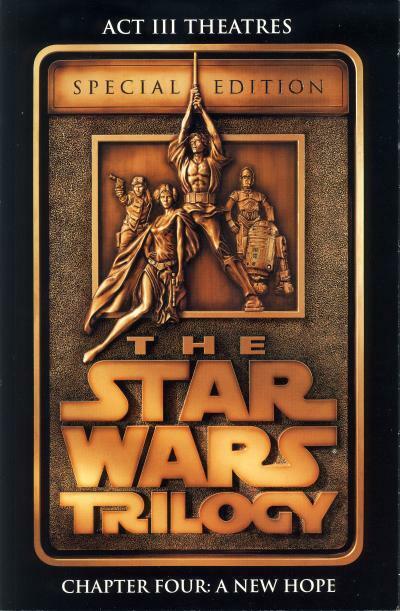 The cover art used is one of the logos for the Star Wars Trilogy Special Edition with an image of Luke Skywalker, Princess Leia, Han Solo, C-3PO, and R2-D2 in bronze. This logo was used on a wide variety of Star Wars merchandise in 1997 including: a poster, a puzzle, trading cards, music CDs, and the VHS boxed set of the movies. 1993 was much like 1992 for the Star Wars comic line with a trickle of comics being published. In 1992 Dark Horse published 2 Star Wars titles, Star Wars: Dark Empire and Classic Star Wars, for a total of 10 comics and in 1993 this would grow to 16 comics. Out of those 16 comics, 10 were for the Classic Star Wars title which reprinted the Archie Goodwin and Al Williamson comic strips. The final 6 Star Wars comics in 1993 were for the second most important Star Wars series at Dark Horse after Dark Empire, Tales of the Jedi. Dark Horse Comics is a short lived anthology title that Dark Horse used to preview stories that would spin off into their own series. 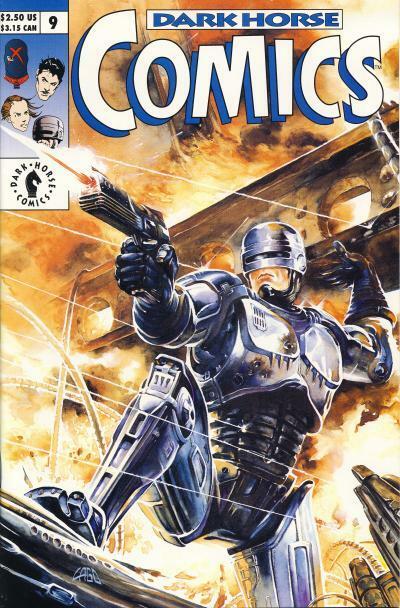 Published from 1992 to 1994, this title ran for 25 issues and mostly contained stories for the various licenses Dark Horse held. It should come as no surprise that two Star Wars titles were introduced in this anthology, the first of which is Tales of the Jedi. Publish from February to April, Dark Horse Comics #7 - 9 contains a story titled The Saga of Nomi Sunrider part 1 which introduces new characters and situations approximately 4000 years before events in the movies, during the era of the Old Republic. Nomi Sunrider is the wife of Jedi Knight Andur Sunrider and mother to infant Vima Sunrider. In the story, her husband is murdered and Nomi uses her latent force powers to defeat the murderers. By setting the story in a different era, Dark Horse opened up new possibilities for Star Wars storytelling. No longer were stories confined to the main Star Wars characters or the time of the original trilogy and readers were eager to embrace these new characters and periods. 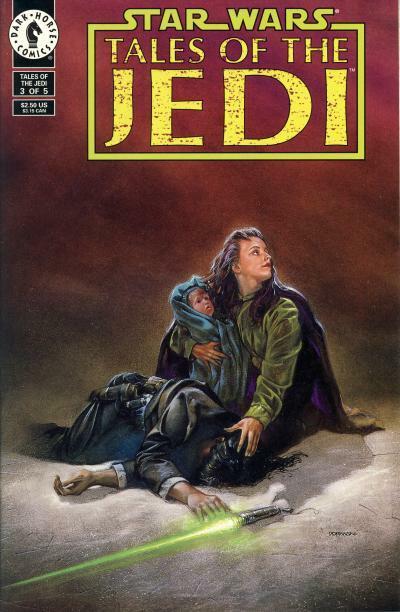 In October, 6 months after Dark Horse Comics #9 was released, Tales of the Jedi #1 was published. This 5-part mini-series is broken into 2 stories. The first story titled Ulic Qel-Droma and the Beast Wars of Onderon takes place in issue #1 and 2. 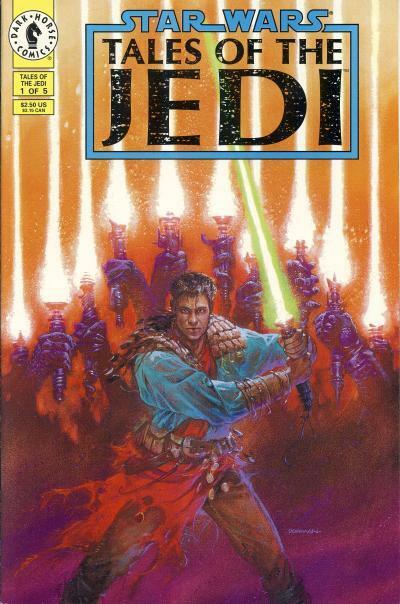 Set in the same time period of The Saga of Nomi Sunrider part 1, it introduces several Jedi that would be used in later Tales of the Jedi mini-series. Tales of the Jedi #3, published in December, kicks off the 3-part The Saga of Nomi Sunrider story. Issue #3 reprints the first part of the story from Dark Horse Comics #7 - 9. The Star Wars: Rebels animated series debuted on the Disney Channel in October 2014. The series is about a band of rebels against the Empire that takes place between Revenge of the Sith and A New Hope. One of the main characters on the show is a human Jedi named Kanan Jarrus. 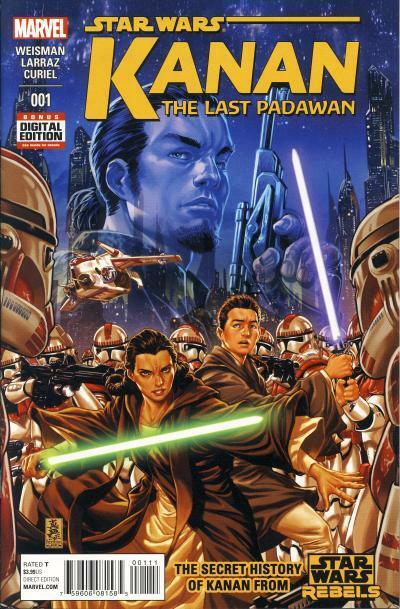 When Marvel launched the new Star Wars line in 2015, Star Wars: Kanan - The Last Padawan was one of the original four titles announced. The first issue was published in March 2015. 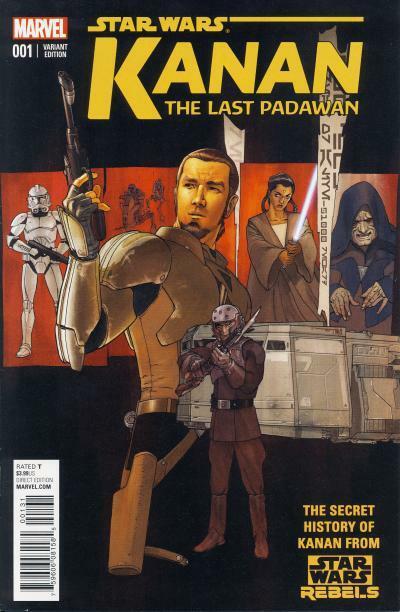 This ongoing series that was renamed to Star Wars: Kanan with issue #7 and ended with issue #12 in May 2016. 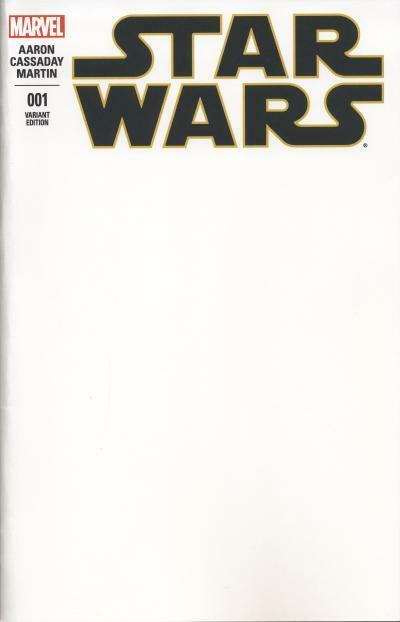 All non-reprint modern Marvel Star Wars titles have a blank cover as a variant for the first issue. The blank covers are of a thicker paper stock which are suitable for artist to sketch on. 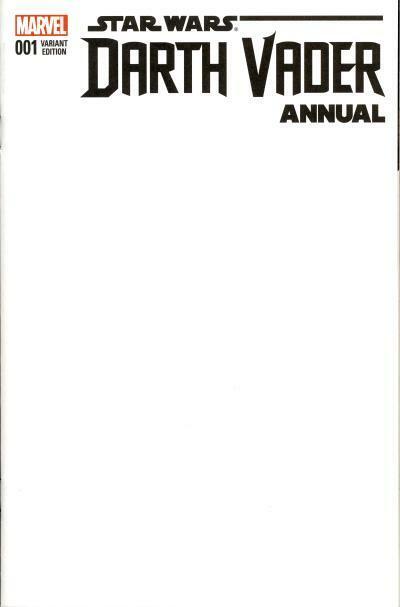 The blank cover wraps the standard cover. 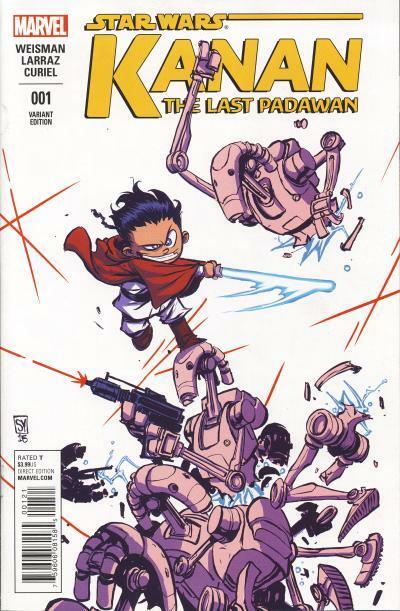 Many of the Star Wars titles debuted in 2015 with a Skottie Young variant cover. Young variant covers for Star Wars feature cute "baby" versions of characters. The Star Wars titles based on characters from the movies have first issue photo covers also known as movie variants. 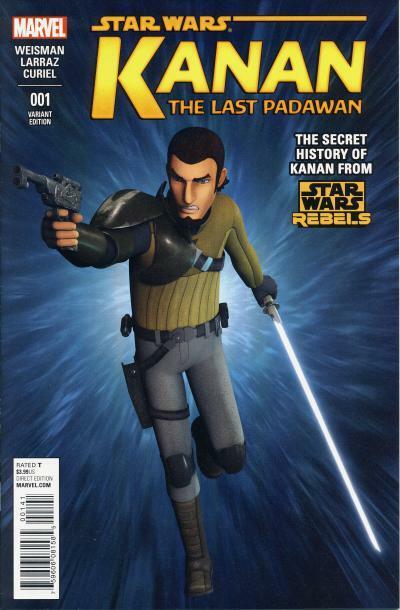 For Kanan, based on a television animated series, there is a television variant. This variant cover is a 1:15 retailer incentive. Kilian Plunket provides art for a 1:25 retailer incentive variant cover. The only store exclusive for Kanan #1 is from the Books-a-Million bookstore chain. 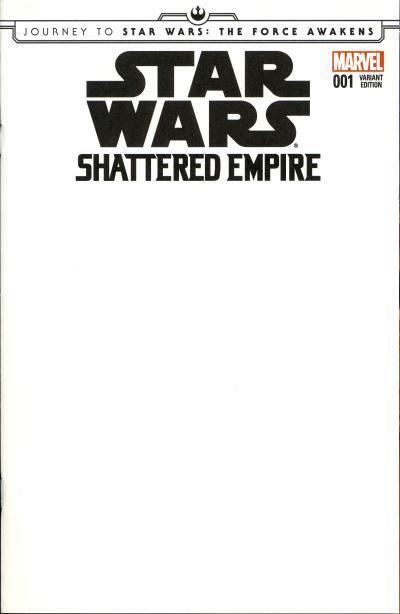 It was one issue in a series of Star Wars covers done for Books-a-Million by Phil Noto. 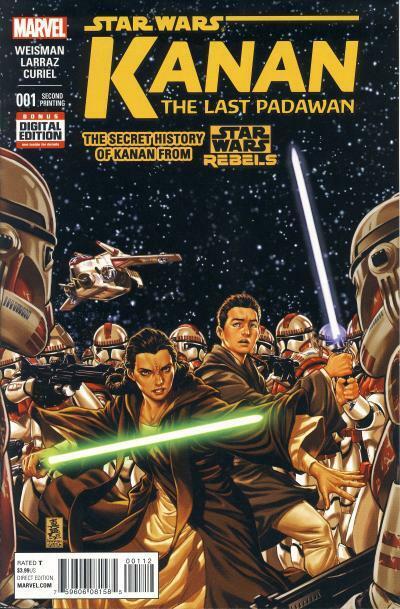 Kanan had the lowest ordered first issue of the new Star Wars titles. It is based on a character in an animated series that was only out for six months. Still, like the other titles, Marvel went back to print for the first issue. Since the earliest Marvel titles, Stan Lee projected a clubhouse mentality about how Marvel operated and invited readers to peek into the behind the scenes machinations of the company. Readers not only read about their favorite heroes, but they also learned about the creators who brought those heroes to the printed page. From 1965 to 2001 these insights into the operations of the company were captured in an informational page in most Marvel comics called the Bullpen Bulletins. This promotional page would feature a list of upcoming Marvel publications; news about titles, television shows, and cartoons that Marvel wanted to draw attention to; profiles of Marvel creators; and Stan even had a column he used to promote Marvel using his unique, flamboyant style with Stan's Soapbox. This access to information about creators and upcoming publications proved to be successful with the readers. In fact, Marvel expanded on the Bullpen Bulletins by creating a comic-sized magazine that would promote Marvel publications for a small fee. This magazine was called Marvel Age and ran for 140 issues from 1983 to 1994. 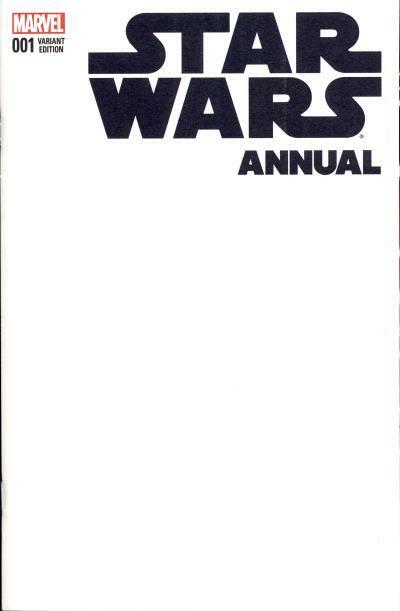 By 1983, the Star Wars title was in it's 6th year of publication and only had 3 years left until it was cancelled. 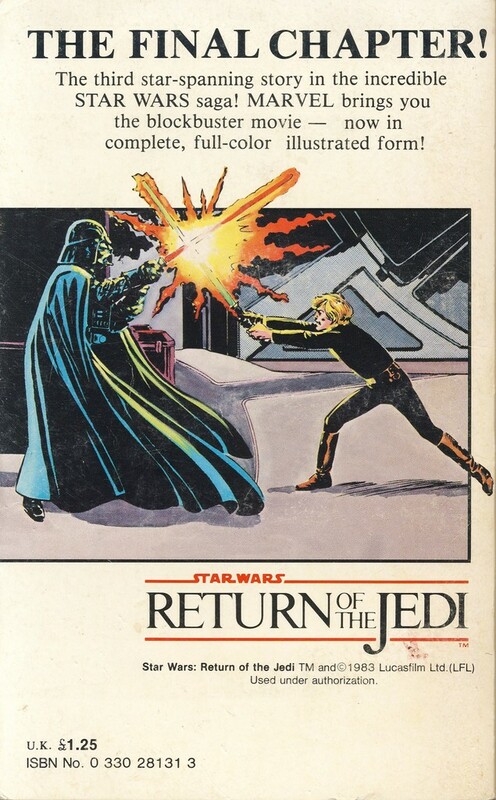 Return of the Jedi came out in the summer of 1983 and the Star Wars title did not have a post-Return of the Jedi story until Star Wars #81 with a cover date of March 1984. 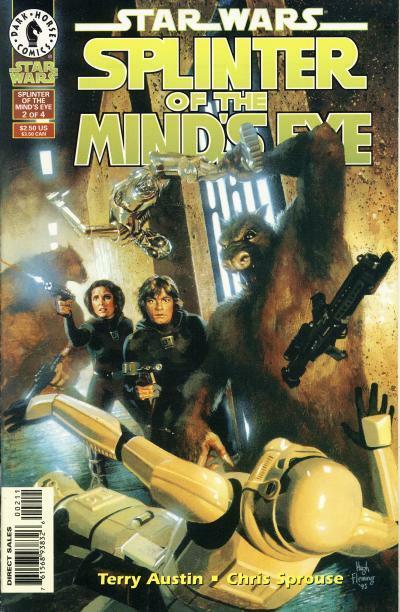 A few months earlier, an interview with Star Wars writer Mary Jo Duffy and editor Louise Jones was published in Marvel Age #10 titled Beyond Star Wars. In the article, the two discuss the direction for the Star Wars title after the pre-Return of the Jedi stories wrapped up. 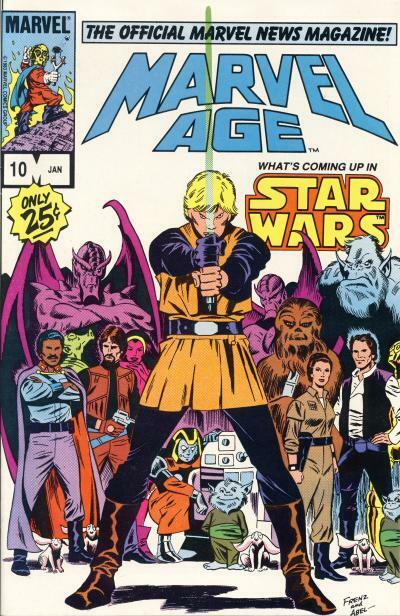 The cover for Marvel Age #10 is by Ron Frenz, the regular artist for Star Wars at the time. Frenz worked on issues #67, 71-82, and 99. On the cover are many characters and aliens that were used during Frenz's run on the title. Front and center is Luke Skywalker. On Luke's right is Lando standing next to the smugglers Chihdo, Rik Duel, and Dani with a Stenax towering over them. On Luke's left is Chewbacca, Princess Leia, Han Solo, and C-3PO. Behind them is another Stenax and a Huhk. Directly behind Luke kneeling next to R2-D2 is Kiro. Several Plifs (the rabbit looking aliens) and Lahsbees are located around the other characters' feet. Humorously, the character box in the upper left of the cover features Forbush Man wearing a C-3PO mask. Did Poe Dameron Fly Right Through a Star in May? The Comics Chronicles released the May 2016 estimated sales. The Star Wars and Darth Vader titles prove resilient, but the Poe Dameron title took a tumble. May's numbers are indicative of a reality with today's comic book market; variant covers sell more comics. 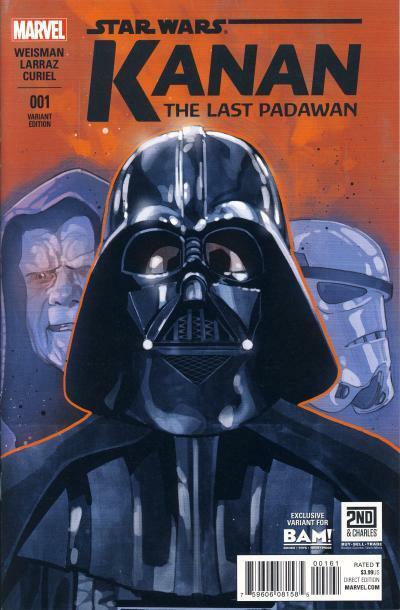 The main Star Wars title saw a negligible drop but Darth Vader #20 saw an increase of almost 10,000 copies. It is no accident Darth Vader sold more units in May; it had three covers where the previous three months only had one cover. It is doubtful suddenly 10,000 more readers jumped on board this title which is set to end with issue #25; it is more likely those extra 10,000 copies were absorbed by the existing collectors of the title. For many years, comic titles use to have mostly steady sales with slight drops in units from issue to issue and the occasional bump when a fan favorite took over or character changing story line took place. With the introduction of crossover events, that all changed. The first big event was Secret Wars in 1984 from Marvel and Crisis on Infinite Earths in 1985 from DC. 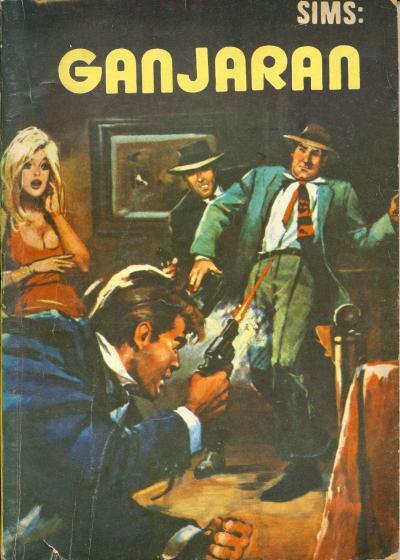 Those events took place in a limited series and crossed over to many of the ongoing titles from the publisher. These big events proved to be successful at increasing sales numbers for the ongoing titles. Fast forward to today, and it is common for publishers to have a big yearly event and several smaller events throughout the year. 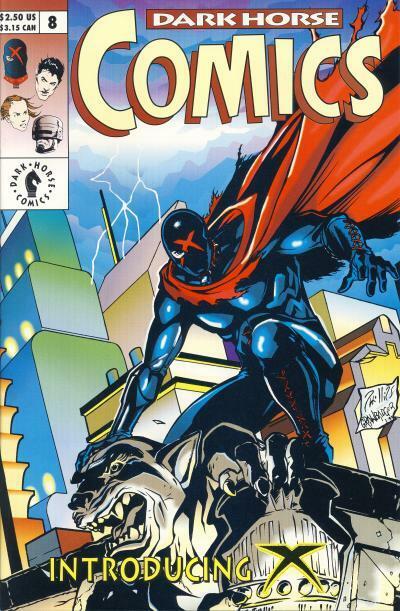 In the 1990s, publishers learned that gimmick covers sold comic books in large numbers as well. Much of the successes and failures of the 1990s are applied by publishers today which explains the huge number of variant covers but a lack of many other gimmicks like holo foil, die cut, embossed, etc. covers. Publishers know retailers will order more comics to get these variants because their patrons want them. The publishers tier these variant covers such that retailers need to buy a certain numbers of copies to qualify for them. A new phenomena that the main two publishers have been employing in the past few years is to replace titles that have stagnated in sales quickly with new titles so they can publish more #1s. It is not uncommon to see titles end after twelve issues or slightly more. The first issue of a title is almost always the best selling issue, so more #1s means more sales. And it also means the publisher can sell more variant covers of that issue too. I bring this up to help explain not only why Poe Dameron replaced Kanan as the new ongoing Star Wars title, but to also explain the 60% drop in sales from the first issue to the second issue. Poe Dameron #2 only had one variant cover in May. Poe Dameron #1 had at least nineteen different covers, including store and convention exclusives. 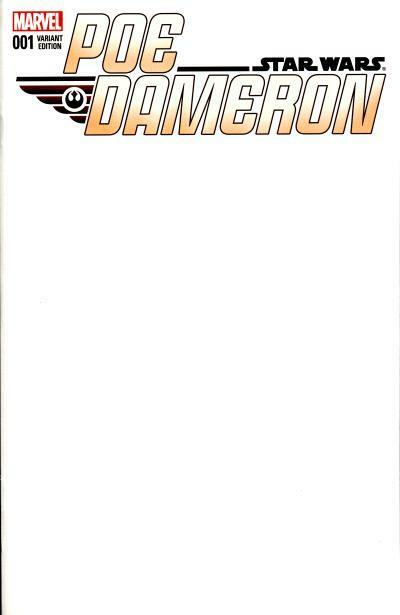 If there were not as many variants for Poe Dameron #1, it would not have sold as well as it did. Kanan sold 108,167 units with its first issue and had far fewer variant covers than Poe Dameron and the second issue sold 64,960 units with two variant covers. Poe Dameron #1 sold over 67,000 more units than Kanan #1, but #2 fell to 68,962 which is only 4,000 units more than Kanan #1. Poe Dameron's drop is not unusual for a new comic either, there are usually massive drops for second issues, especially those which have a huge number of cover variants. Unfortunately, if Poe Dameron's number follow the usual pattern, this title will be replaced in a year or a little more. It is unfortunate that the first ongoing comic featuring a main character from the new Star Wars trilogy of movies is not selling better. The Obi-Wan and Anakin mini-series completed in May and saw a standard drop in units sold. Next month we will see the numbers for both the Han Solo mini-series and The Force Awakens adaptation. The average sale per issue would rank 11th on the top 300 chart for the month of May. Star Wars trade paperbacks are selling well and reorders remain strong but are not accounted for with these numbers. Take a look at the Star Wars Sales Estimate Chart and please read the blog posting May 2016 comic sales estimates online; DC Rebirth tops 235k in orders. In England, the three paperback versions of the original Star Wars movies all had different publishers. 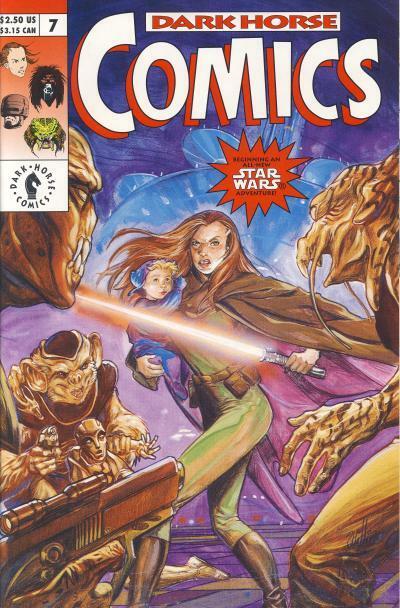 Sphere Books published the Marvel Comics Illustrated Version of Star Wars. Arrow Books published the Marvel Comics Illustrated Version of The Empire Strikes Back. Finally, Piccolo Books published the Marvel Comics Illustrated Version of Return of the Jedi. The Return of the Jedi paperback published by Piccolo Books was also released in Australia. 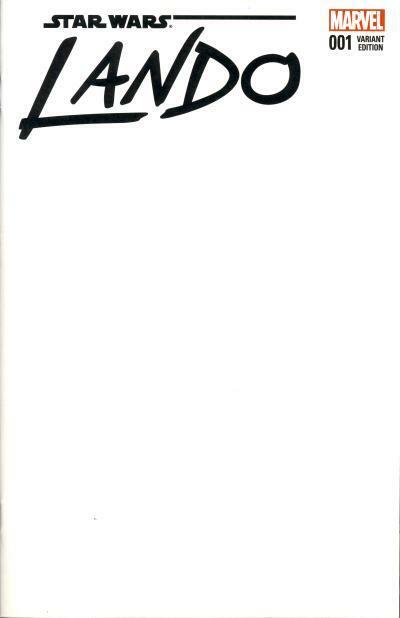 To account for the difference in cost (the paperback cost 1.25£ in England and $3.50 in Australia) a round sticker was placed over the price for the copies released in Australia. The British price on the back of the paperback is not covered by a sticker. Hastings filed for chapter 11 bankruptcy on June 13, 2016. Chapter 11 will allow Hastings to stay open while they reorganize finances and prepare the company for sale. Hastings owes Diamond Comic Distributor, the largest comic distributor in North America, a reported $1.5 million. On June 15th, Hastings did not receive their weekly shipment of comics and at least one website, Bleeding Cool reported about the problem. 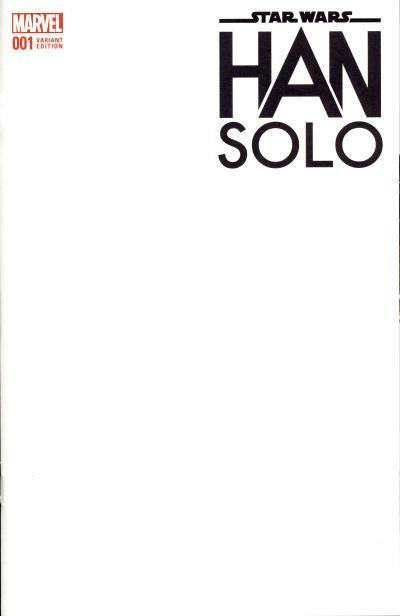 Collectors began speculating about the Han Solo #1 Hastings exclusive and whether or not it was published or would be sold. It turns out the comic did ship to Hastings the following week on June 22nd. The interior pencils for Han Solo #1 are by Mark Brooks. To my knowledge, Mark Brooks has only done covers for the Marvel Star Wars line and this is his first interior work for a Star Wars comic. He also did the art for the Hastings exclusive cover. The cover art is a picture of Han Solo and Chewbacca in front of the schematics for the Millennium Falcon. In my opinion, this comic has the best interior artwork so far for the Marvel line. This month, IDW is soliciting more Star Wars micro comics beyond those for the 3 original Star Wars movies. The solicitation is for Star Wars Icons Micro Comic Collector Packs which introduce 6 micro comics based on the new Marvel Star Wars line. The pack content is changing from the first 2 sets with each pack now containing: 1 micro comic, 1 poster, 1 trading card, and 1 decal. The 3-D glasses are being dropped which presumably means the posters will not be in 3-D. So far, only the Star Wars and Empire Strikes Back micro comics have been found at retail. The Empire Strikes Back micro comics have an ad in the back which mentions Return of the Jedi micro comics available in June 2016. Star Wars #42 has the distinction of being the first standard formatted comic appearance of Boba Fett in the United States. It is one of a handful of comics in the original Marvel Star Wars run that has broken out and sells for more than surrounding issues. Boba Fett, while only having brief appearances in the Star Wars movies, is a fan favorite character and it is only natural his first appearance is sought after by collectors. In 2015, when Marvel reacquired the Star Wars license, it published a series of hardcover editions of the original movie adaptations. It used that opportunity to update the colors used in the original adaptations, applying modern coloring techniques to the classic art. IDW's micro comics for the Star Wars and Empire Strikes Back adaptations are based on this new colored art. The first thing you notice when comparing the original Star Wars #42 cover to the micro comic cover is the detailed planet behind the three bounty hunters rendered in shades of purple. The original cover uses an all white planet which allows the three figures to pop whereas the purple shades of that planet mutes their appearance on the new cover. On the new cover, Boba Fett, Dengar, and Bossk all receive more accurate coloring which matches their appearance in the movie. The text blurbs on the cover has been changed from having an all white background to having a dark to light yellow gradient. This in turn necessitated a change of the Star Wars logo from yellow to white. Technically, the cover for the micro comic is better. Aesthetically, the original is more pleasing because it highlights the bounty hunters better. It is unfortunate a lighter color for the planet behind the three bounty hunters was not chosen; it would have provided a better juxtapose for the figures in the foreground. A better cover would be the original white planet (with some rendering of details which is a nice touch) with the movie accurate colored characters. 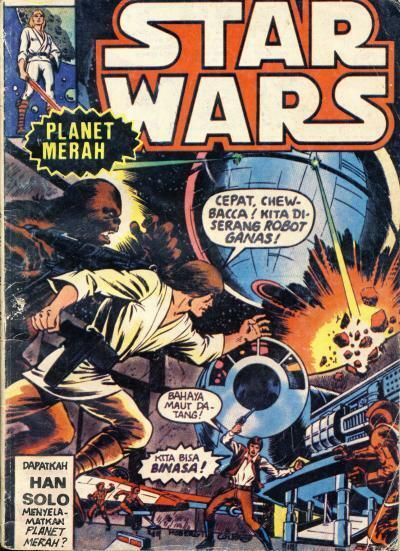 Some of the original Star Wars stories in Indonesia were printed in multiple comics. Sims: Ganjaran or Sims: The Rewards from publisher Yayasan Karya Bhakti Bandung features a non-Star Wars lead story titled Ganjaran suatu Kegagalan or The Rewards of a Failure. The last story in this comic is a Star Wars tale titled Planet Merah or Red Planet. It is the same content from the comic with the story's title. Since neither comic has a publishing date, it is not clear which is the earlier printing of the story. Sorry for the break in postings. I have been away on vacation and overestimated how many postings I would be able to do while I was away. I am home now and will resume posting tomorrow.